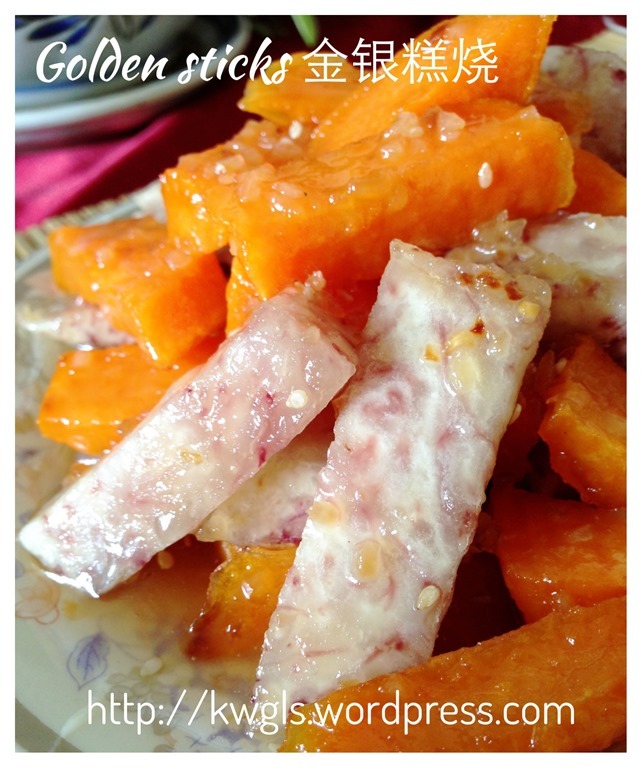 This is a common Teochew household dessert or snack that most Teochew (Chaozhou) granny will know how to do.. Usually yam cubes were used . 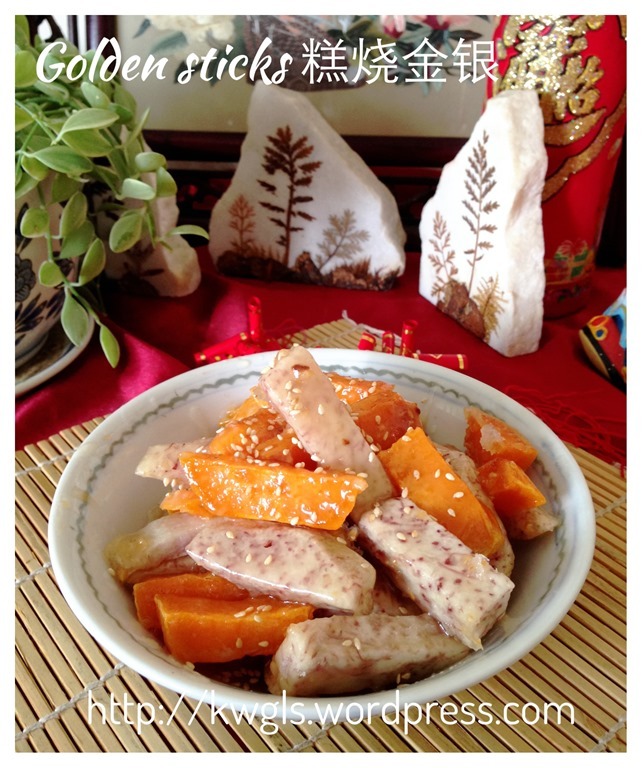 However, for Chinese New Year, sweet potatoes were added and purposely cut into stick form so that they resemble gold bars and yams as silver bars signifying abundance of wealth..
All these are simple recipes that use sugar and water as the main ingredients to sweeten the yam or sweet potatoes. 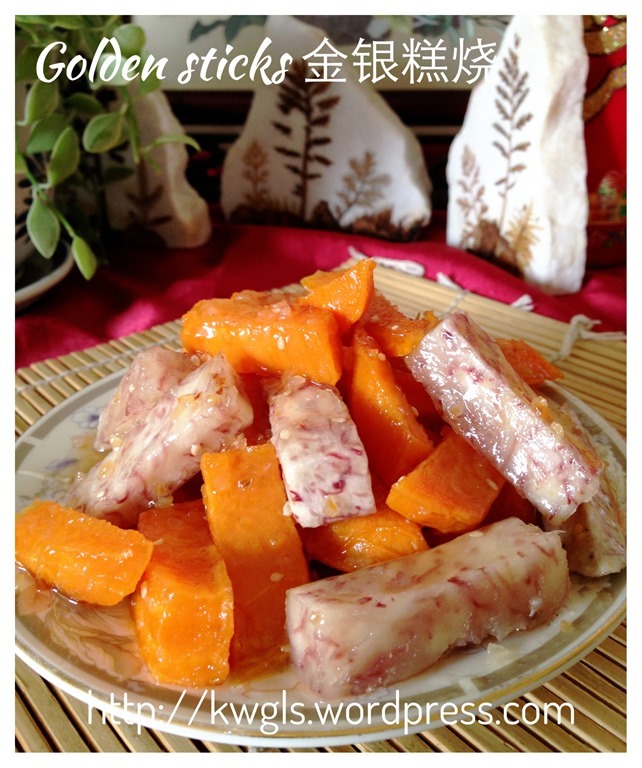 It can be easily prepared at home and all that is needed is some experiences or practises…Don’t worry, too watery will become this recipe, to thick will become candid floss and when sugar recrystallized, it is another dessert. 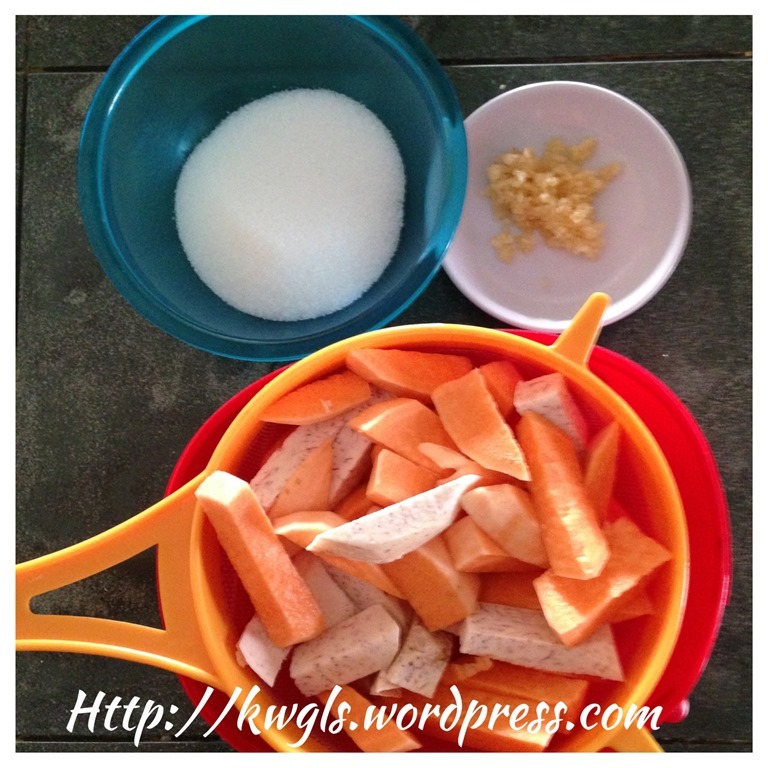 In the event that your sugar recrystallized, add water and it will come back to this recipe.. Is it not fun to play with these traditional recipes? Traditional household recipes are generally very easy and definitely easier than in this illustration. For home consumption, shape is not of absolute importance and the prime consideration shall be a healthier dessert and I will share the simplified steps later. Heat up some cooking oil in a wok. The oil is considered as hot enough when a wooden chopstick inserted into the hot oil, bubbles start to emit. 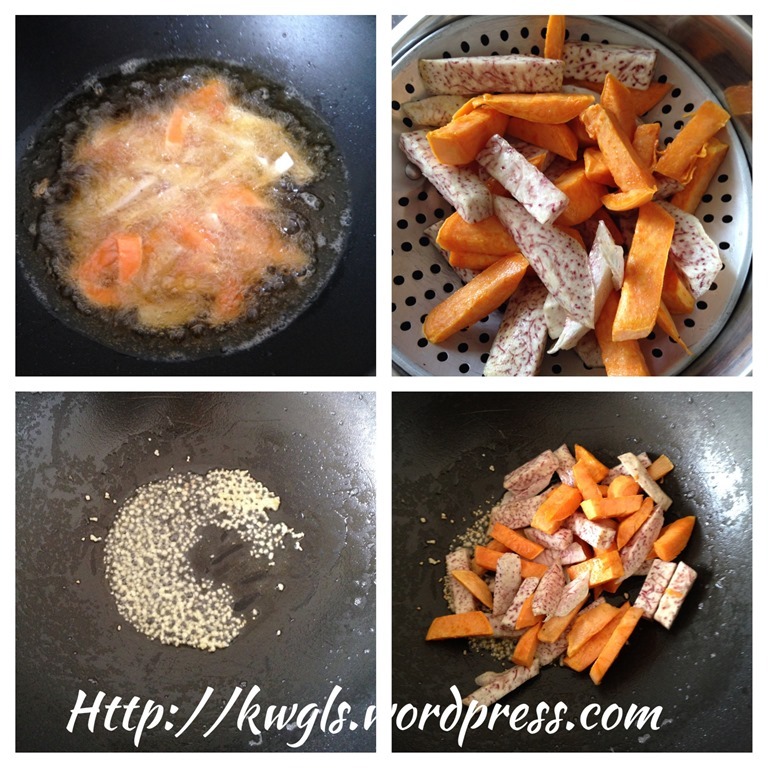 Add in the sweet potatoes and yam sticks. Turn the heat to medium. Deep fried the sticks until the exterior are hardened. 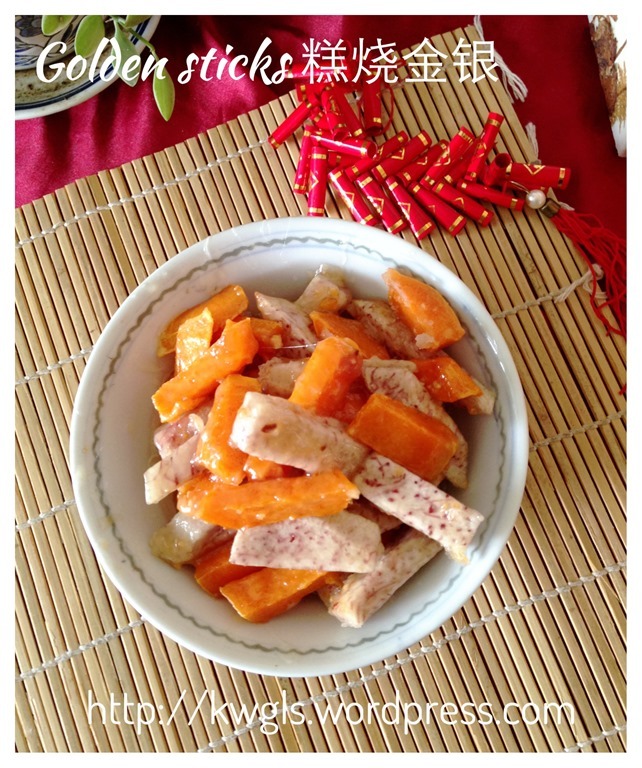 Note that the step of deep frying is optional and and the purpose is to maintain the shape of the yam stick from disintegration when cooked. 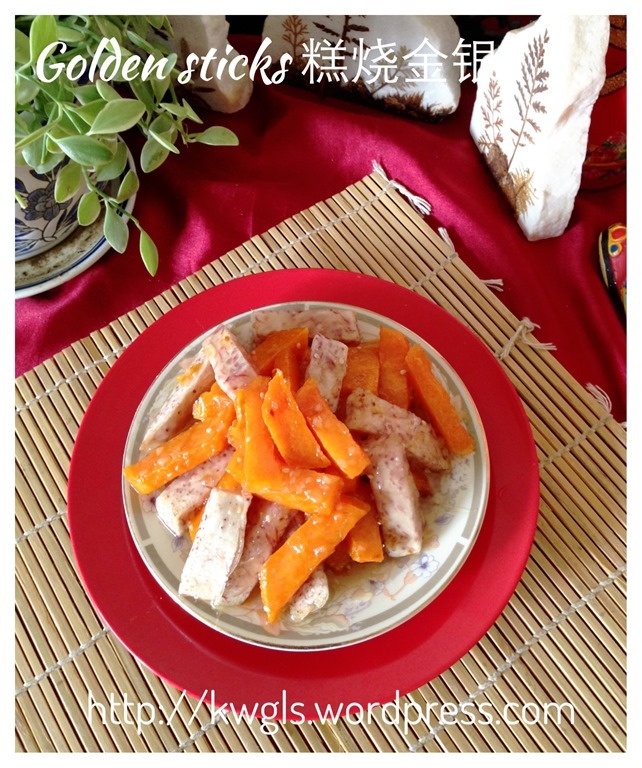 These yam and sweet potatoes sticks will continue to get cooked in the next step. It took me about 10 minutes to get the texture I wanted. Drain and set aside. In the same wok, put the minced shallots and garlics, sauté until it is slightly brownish. 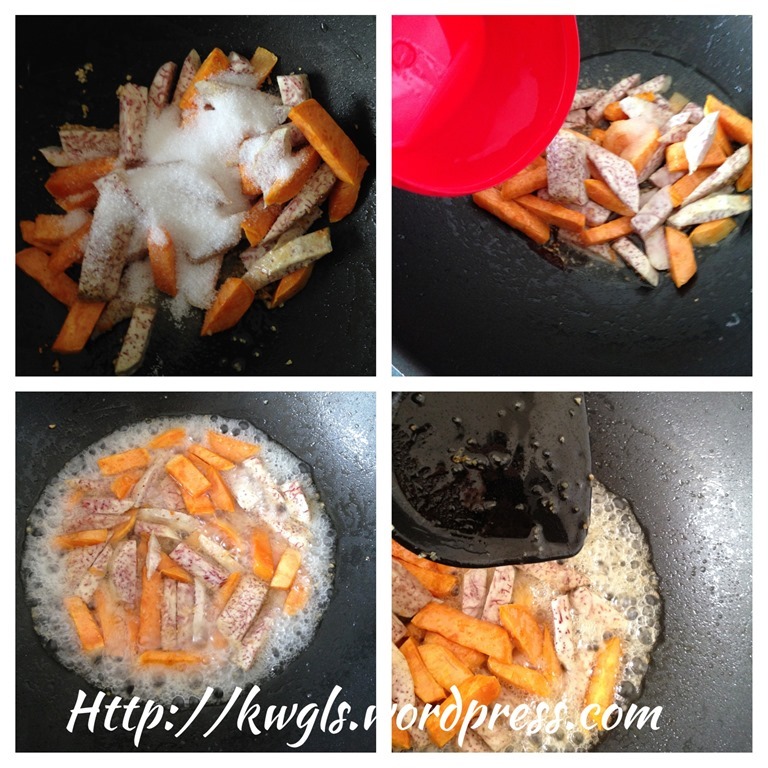 Add the deep fried yam and sweet potatoes sticks. Stir fry for one minute until well mixed. Add the sugar followed by the water, bring to boil and continue to simmer until it reaches thick syrup form. You will witness the bubbles start to get bigger and bigger. Use a spoon to take the syrup out and when the syrup exposed to the air, if it flow thickly, it is considered as done. If it become some floss like or sugar recrystallize, It has been overcooked. Add a bit more water to dissolve the candy or crystallized sugar and cook until the sticky, gooey texture is reached. Best served warm when it is hot.. 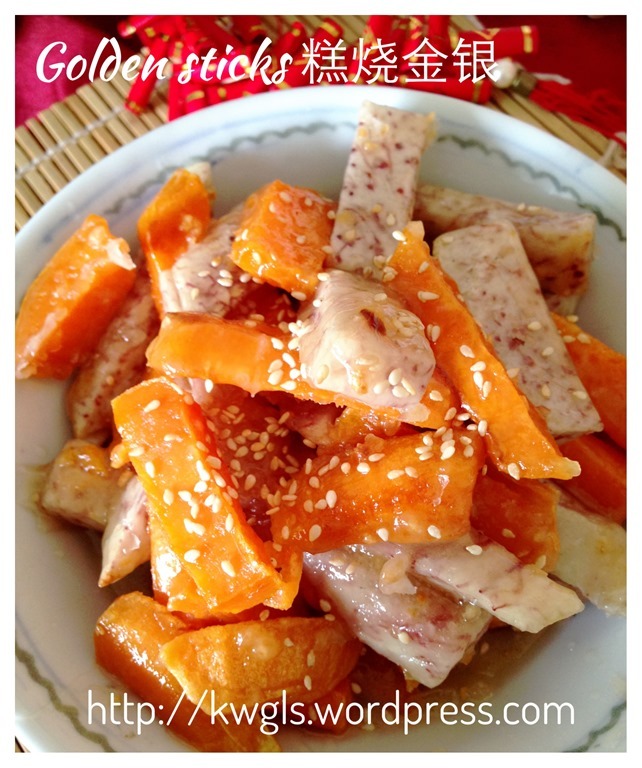 Sprinkled with some sesame seeds if desired. Most tuber roots can be used. 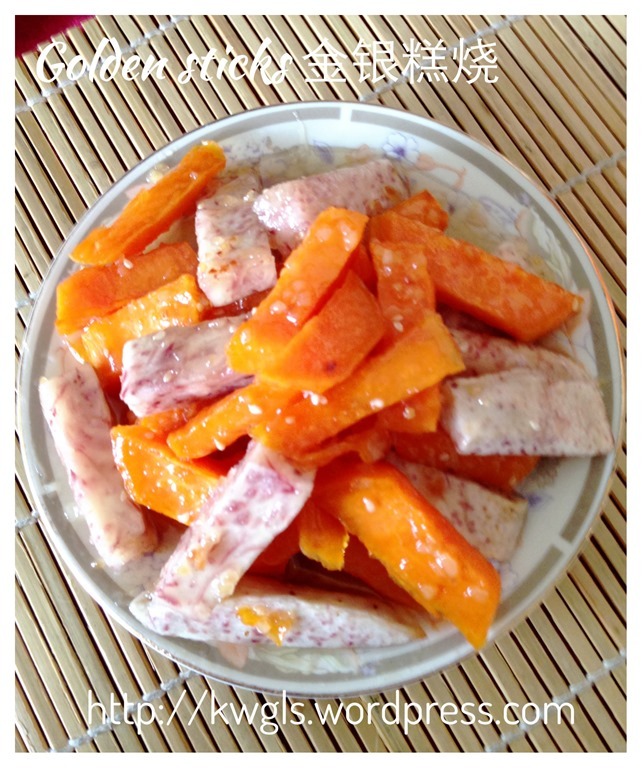 Besides yam(taro) and sweet potatoes, you can also use tapioca. 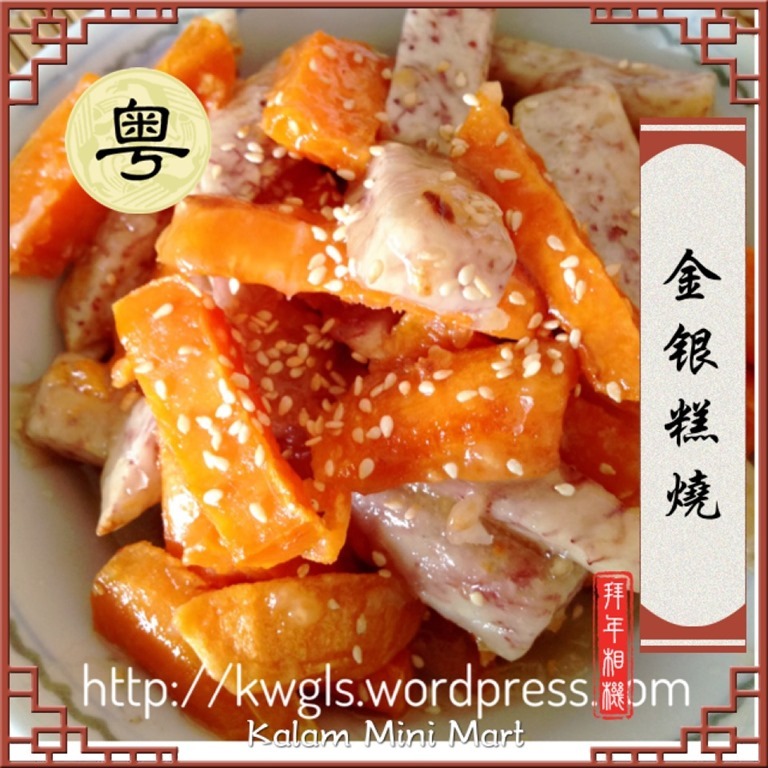 Shape of the yam and sweet potatoes is of individual preference. It can be in stick form or cube form or even mould into flower shape. Shape will affect the timing of the cooking,. The smaller it is , the shorter will be the timing. 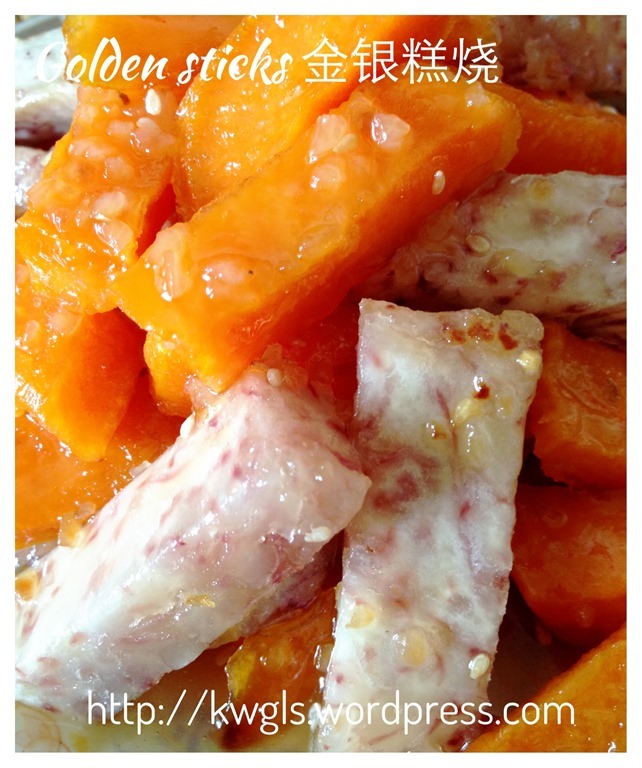 For home consumption, there is no need to deep fry the yam and sweet potatoes. The main purpose of deep frying is to maintain the shape of the yam and sweet potatoes. 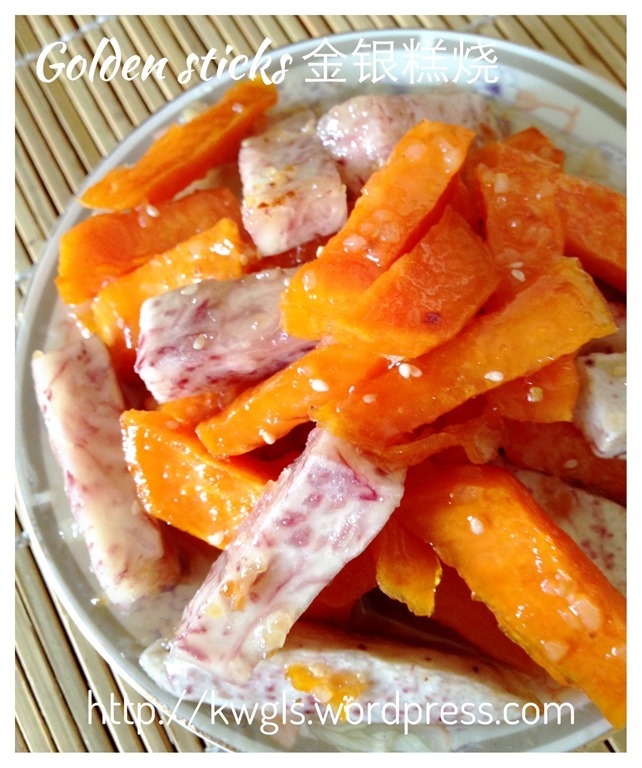 As such, after sautéing the minced shallots, add the yam plus sweet potatoes, add adequate water to simmer the yam until soft, add sugar and continue to cook until thick syrup form. Off heat and serve when hot. The yam and sweet potatoes may slightly disintegrate if overcooked but it will be a healthier alternative..
To make it even healthier, sautéing can be omitted, just add water and sugar to yam and sweet potatoes stick, simmer until thick syrup form.. But it lacks the aromatic that shallot oils gave. 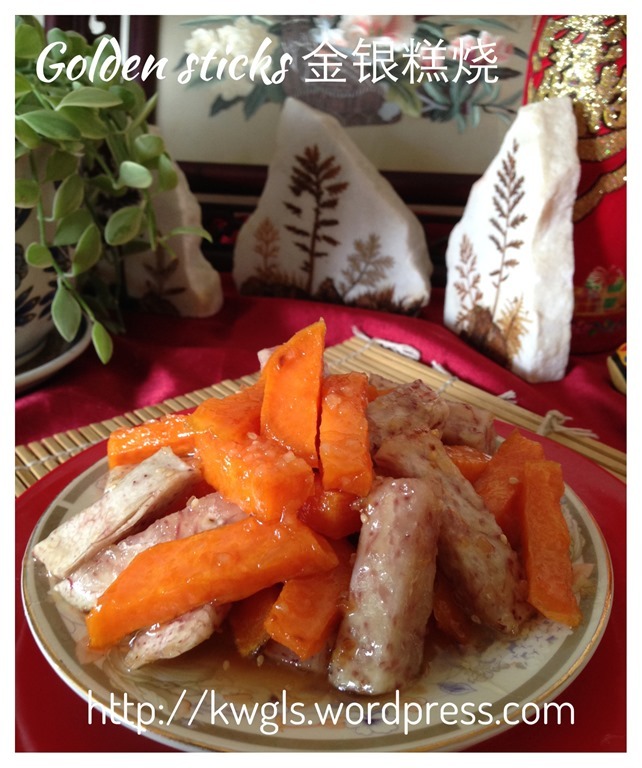 This entry was posted in Chinese and Asian Cakes and Snacks, Desserts, Food Preparation Series and tagged 8, 糕烧芋头，高烧地瓜， shiny glazed sweet potatoes, 金银糕烧, GUAI SHU SHU, Guaishushu, kenneth goh, postaday. Bookmark the permalink.